Mike Pavolonis is a physical scientist at the NOAA/NESDIS Center for Satellite Applications and Research (STAR). He works within the Advanced Satellite Products Branch (ASPB), located in Madison, WI. Mike received his B.S. in Meteorology from the Pennsylvania State University (2000) and his M.S. in Atmospheric and Oceanic Sciences from the University of Wisconsin - Madison (2002). Prior to joining STAR in September of 2005, Mike worked as a researcher in the Cooperative Institute for Meteorological Satellite Studies (CIMSS) at the University of Wisconsin from May 2002 - August 2005. Early on, while working at CIMSS, Mike's research focused on studying the energy budget in the Antarctic using satellite- derived data sets and a regional climate model. Since then, Mike's research has primarily focused on developing new remote sensing techniques for inferring cloud properties from space. He developed automated multilayered cloud and thermodynamic phase detection algorithms for both heritage (e.g. AVHRR) and new sensors (e.g. MODIS, VIIRS, and ABI), with an emphasis on improving satellite-derived climate data sets. In addition, Mike has worked on developing new techniques to automatically detect volcanic aerosols from space in an effort to help prevent dangerous aircraft encounters with volcanic clouds. With the advent of new, more advanced, hyperspectral sensors such as the AIRS and the IASI and active spaceborne sensors such as the GLAS, CALIPSO, and CloudSat, cloud research has benefited greatly. Mike is currently utilizing the active sensors, which are capable of providing vertical profiles of extinction through cloud layers, to help validate products derived from passive sensors. He is also utilizing high- resolution infrared spectra, such as from the AIRS, both alone and in concert with high spatial resolution imager data and active sensor data, to study ice cloud microphysical and dynamic processes on a global scale. Mike has also worked on developing remote sensing techniques for future instruments such as the GOES-R ABI and VIIRS on NPOESS. 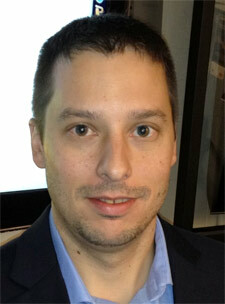 He is a member of the GOES-R Algorithm Working Group Cloud and Aviation Application Teams. He developed the Geostationary Cloud Algorithm Testbed (GEOCAT) software, which is used for developing, implementing, and testing GOES-R algorithms. He also developed the Low Earth Orbiting Cloud Algorithm Testbed (LEOCAT) for developing, implementing, and testing NPOESS algorithms.